UPDATED: Sat., Sept. 23, 2017, 8:04 p.m.
KENNEWICK – Children in the Northwest might not see the fluttering orange and black wings of a Monarch butterfly on a summer day a few decades from now. A study published recently in the journal Biological Conservation documents the steep decline of the population of migrating monarchs in the West. “This study doesn’t just show that there are fewer monarchs now than 35 years ago,” said Cheryl Schultz, an associate professor at Washington State University Vancouver and lead author of the study. “It also tells us that, if things stay the same, western monarchs probably won’t be around as we know them in another 35 years,” she said. The study puts the risk at 72 percent that not enough of the monarchs will be migrating in the West within 20 years to sustain the population. In 50 years, the risk is 86 percent. More is known about the larger population of eastern monarchs, which also is in decline. The study led by Schultz showed that western monarchs are faring worse than monarchs in the East. Western monarchs that breed in Washington, Oregon, Idaho, Nevada and California head south for the winter to roost in clusters on eucalyptus and pine trees along the California coast. Those coastal residents began noticing in the 1990s that there didn’t seem to be as many monarchs as there were in previous decades. Hundreds of volunteers began collecting data to learn more in an annual Thanksgiving count of hundreds of California roosting sites in 1997. The data they collected was the starting point for the new study. Schultz used newer statistical methods to combine the Xerces Society’s Thanksgiving Count data from 1997 to 2006 with more sparse data collected by amateurs and professionals back to the early 1980s. Researchers knew they would find a decline. They were surprised by the rate. In the 1980s, there were about 10 million monarch butterflies overwintering on the California coast. Now, only 300,000 monarch butterflies are estimated to roost across hundreds of coastal sites, the study found. She said possible culprits may be those identified in the East – a loss of breeding and overwintering habitat, pesticide use and possibly climate change. In overwintering areas, the threat to habitat is development and the aging of trees where they roost. In breeding areas, their fate is tied to milkweed, where monarchs lay their eggs and their yellow, black and white-striped caterpillars feed on the plant’s leaves. But the amount of milkweed is declining. It’s less likely to remain at the margins of fields and in the rows within orchards because of both herbicide use and the ability to extend fields to the edges of property. Some states routinely spray most roadside vegetation, which includes milkweed. The decline may be more complicated than just the loss of habitat, however. Schultz and another author of the study, Emma Pelton of the Xerces Society in Portland, hiked across the Umatilla National Wildlife Refuge this past week to look for monarch butterflies and caterpillars in stands of milkweed there. The refuge “has vast areas of milkweed and not many monarchs,” Schultz said. That might be because there is more to the migrating monarchs’ biology than the milkweed plant, she said. Or maybe there are just not enough of the monarchs overwintering to make it back to the refuge in large quantities. The monarch butterfly that leaves the California coast is not the same one that may arrive in the Mid-Columbia. The first generation may get no farther than central California and its offspring may travel farther north. Eventually the grandchildren or great-grandchildren are making their way back to the Mid-Columbia, but they are not filling the area, Schultz said. “We need to figure out now how to recover them,” she said. 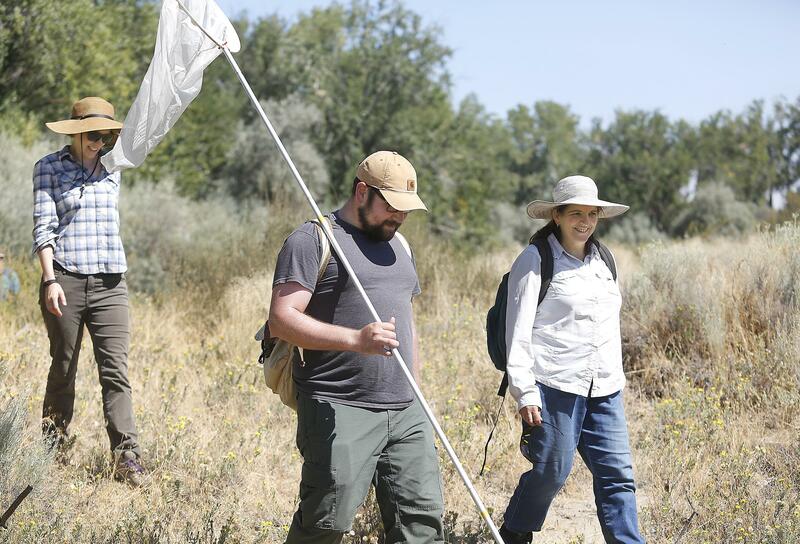 The study she is working on is to understand where and when monarchs are breeding in the West. It is paid for by the Department of Defense, which is interested in how it could manage its western land to balance needs such as training with natural resources protection. The study published recently was paid for by the U.S. Fish and Wildlife Service, which is considering whether to list the monarch butterfly as a threatened species under the Endangered Species Act. Published: Sept. 23, 2017, 6:05 p.m. Updated: Sept. 23, 2017, 8:04 p.m.